>> Between traveling for work and a busy week in general, I was really looking forward to the weekend, especially since it would be low key with not much planned. We spent Saturday doing a bit of Christmas shopping at the mall and stopped by a few holiday parties. Sunday I was SUPER productive (as you can see from the decorations above!). >> I'm really excited about all the DIY projects I have going on right now. I'm not going to share what they are specifically since some of them are Christmas presents but I'm really dang excited. 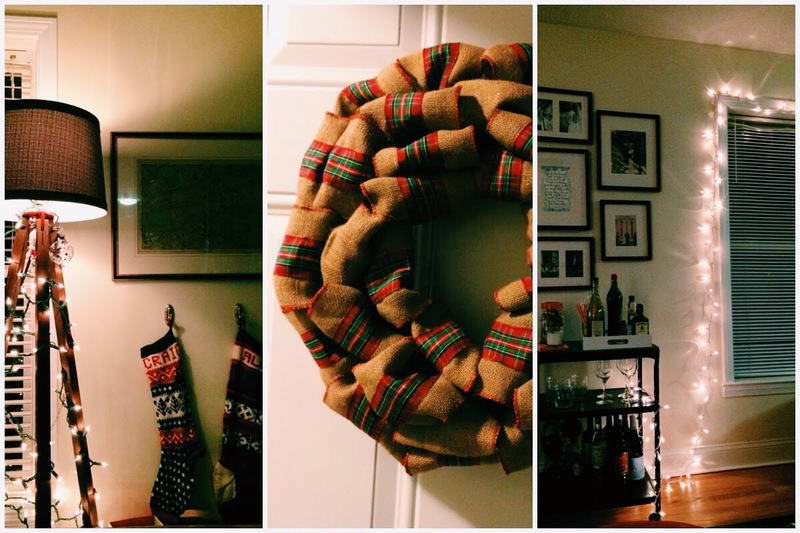 I will share the tutorial for how I made the burlap wreath above. It took all of 15 minutes and I think it looks awesome. >> We got a slow cooker for Christmas (delightfully early!) which I'm so pumped about. We made this soup last night and it was delicious, so easy. Love a good recipe where you throw everything in a let it cook away. Also, do you have any favorite slow cooker cookbooks or recipes? Send them my way! >> TJ Maxx has some GREAT holiday goods right now especially wrapping paper and adorable ribbon. I stocked up on some supplies on the cheap including the burlap for the wreath! I need to frequent these places more often! >> If you love lipstick but also crave hydration, this stuff is the answer. It's expensive but worth it. The color impact is great but also super moisturizing, best of both worlds. This color (fleur bleue) is exclusive to Sephora and it's perfection. >> This is THE BEST cleanser ever. There, I said it. Go get it now.